There’s something very fishy in Bangkok. Not the tuk tuk driver who lured us into his vehicle with a low-priced offer then refused to take us to our destination. Nor the two nicely-dressed businesspeople who approached us on the street to direct us to their favorite places, for no apparent reason. I’m referring to the one-of-a-kind, larger than life Seafood Market and Restaurant. Never before have I seen a restaurant quite like this. You can’t miss it as the giant garishly-lit neon sign strung across the road (Soi 24, off Sukhumvit) points you toward a parking lot which looks as though it would land a jumbo jet. Once you walk through the door, you’ll find yourself in a 1,500-seater dining hall, with the brassy slogan “If it Swims, We Have It” emblazoned across the wall while scarlet-clad waiters scurry around the room, carrying trays of food. The slogan’s not strictly correct as there were a lot of swimming things missing, but it does a darned good job at overwhelming you with selection and helping spend your money on the overflowing array of seafood. Your first move, after bagging a table, is to explore the 50-meter-long wall packed to the gills with fresh, raw seafood spread across beds of ice and to make your selection. There’s Maine lobster, Alaskan crab, tiger prawns, clams, oysters and sushi. There’s pomfret, red snapper, cuttlefish, scallops and sea perch. There’s an area where you can pick fresh vegetables, bread and salad. And there’s a section where you choose your wine or alcohol. It’s a giant supermarket of seafood. Once you take your enormous selection to your table (you can’t be satisfied with just a couple of dishes), a dining steward asks how you’d like each dish prepared – grilled, barbecued, fried, sautéed – then whisks it all off to the kitchen. 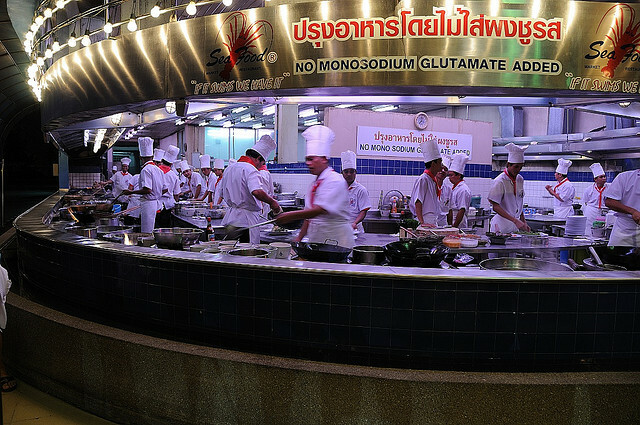 Behind glass walls, more than 20 chefs, wrapped in crisp white aprons and tall cooks hats, move rapidly, displaying their kitchen dance to fascinated spectators as they chop, peel, fry and steam, whipping up the night’s dishes with incredible speed and delivering them right back to you. Before you can say “Holy Tuna”, there’s a crisp salad dressed with white crab gently placed alongside the sushi roll and a half dozen fresh oysters. It’s closely followed by scallops sautéed in white wine, cuttlefish barbequed with Asian sauce, deep-fried calamari and crispy French fries, hot on the heels of the largest king prawns you’ve ever seen outside the pages of National Geographic. It’s a veritable feast of indulgence. It’s fishing without the patience; cooking without the hassle. While it may be a bit of an assault on the wallet since there’s a charge for everything (cooking charge, salad charge, wine charge, etc), the experience alone is worth every penny. It may not be a place for regular meals, but for a one-time foray into this underwater world of crustaceans, bivalves and mollusks, Bangkok’s Seafood Market and Restaurant is swimmingly divine. 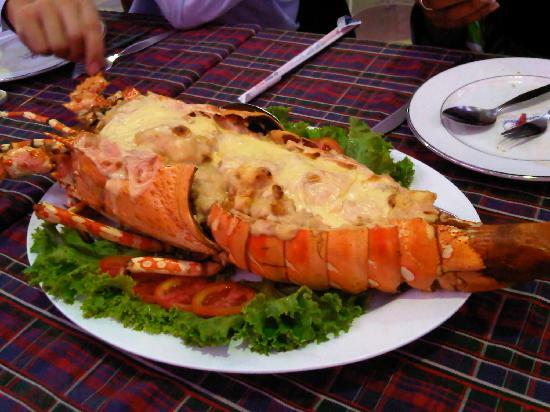 Seafood Market and Restaurant Co.,Ltd.